Nestled on the ground floor with a window as big as a wall, The Avenue has the best people-watching seats on Central Avenue. It’s that view that gave The Avenue its name. For more than a hundred years, Central Avenue has been the gathering spot for locals and visitors. Photos of some of those people adorn the walls of the restaurant in homage to this history. History is what The Avenue and its host hotel, The Waters, are all about. The Avenue is a 700 square-foot L-shaped room with original brick forming one wall and a large window across the front. There are approximately 10 high tops with chairs in the Lounge & Bar area, and 20 to 30 tables in the restaurant area. The space can easily accommodate your friends for happy hour, your family for dinner or brunch, or your department for a work celebration. But there’s much more to The Avenue’s story than tables and chairs. The Avenue’s distinction begins with the historic architecture of its host building, The Waters hotel. Built in 1913 and formerly known as The Thompson Building, it was designed by renowned Arkansas architect George R. Mann, the principal architect of the Arkansas state capitol. The classical revival-style façade of terra cotta Corinthian pilasters has a distinctive appearance that creatively blends classic elements with a bold, storefront design echoing the rhythms of the 1920s. Inside, great care has been taken to preserve the classic marble, ironwork, and historical details while also modernizing it for guests and diners. Even with deterioration from age and neglect, the Thompson Building attracted the attention of local architects Bob Kempkes and Anthony Taylor. The two had earned many local, regional and national awards for their renovation of several historic properties in and around Hot Springs: The Mountain Valley Water building, Quapaw Bathhouse, Superior Bathhouse, and Hot Springs Depot. The architects partnered with Robert Zunick, an investment banker, to purchase this building and renovate it with a level of care and attention to details that would elevate not only the building but also this section of Bathhouse Row. In 2015, they began the $7 million renovation which was a labor of love. Skilled artisans cleaned and repaired interior and exterior marble, tile, woodwork and ironwork. The stability of brick walls throughout the building meant they could be preserved to add a warmth and old world feeling to those rooms. 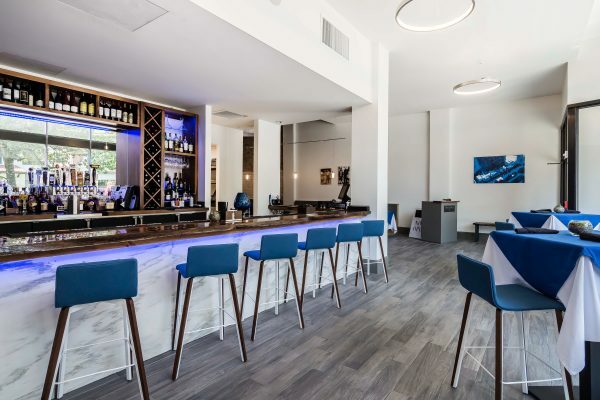 Opened in 2017, The Waters and The Avenue are a tribute to the past with the comfort and state-of-the-art amenities discriminating travelers require. The crown jewel of the renovation, The Avenue, was added to provide a delicious gathering place for families and friends. 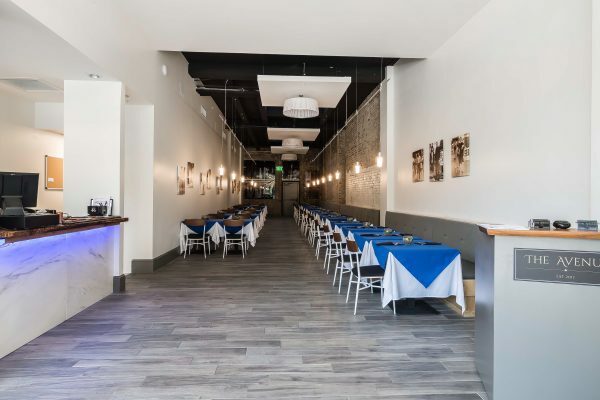 The southern artisan-style restaurant serves sophisticated food in a casual environment where friends and families can be comfortable and really enjoy each other’s company over a wonderful meal, has been key to the The Avenue’s success. “I want to give everyone who comes to The Avenue an unforgettable experience, and not just because of the food. 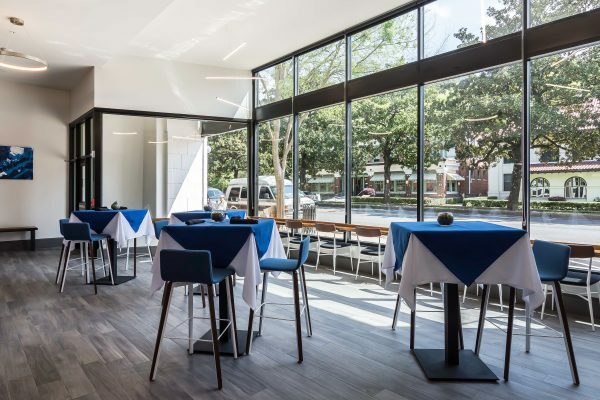 Our team’s goal is for our guests to enjoy the company, the people-watching, and the comfort while also having a great meal and great service,” said Casey Copeland, The Avenue’s award-winning chef and Le Cordon Bleu alumnus. Put it all together with a service team steeped in Southern hospitality, and you have a boutique hotel and restaurant built just for you. The Avenue is available for complete rental for corporate, wedding or other events. Or perhaps you just have a large group – work celebration or bridesmaid’s luncheon or whatever – and want to make it special.